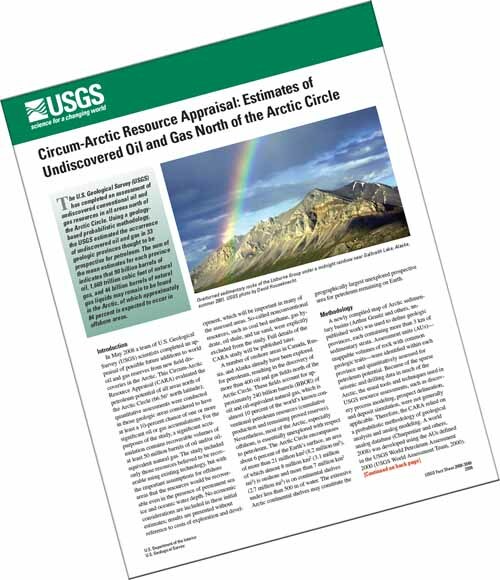 The U.S. Geological Survey (USGS) has completed an assessment of undiscovered conventional oil and gas resources in all areas north of the Arctic Circle. Using a geology-based probabilistic methodology, the USGS estimated the occurrence of undiscovered oil and gas in 33 geologic provinces thought to be prospective for petroleum. The sum of the mean estimates for each province indicates that 90 billion barrels of oil, 1,669 trillion cubic feet of natural gas, and 44 billion barrels of natural gas liquids may remain to be found in the Arctic, of which approximately 84 percent is expected to occur in offshore areas.